On Friday, October 20, 2017, sharply dressed, a bit bleary-eyed, a dozen UVM business majors meet at BTV airport for a 5:30 a.m. flight to New York’s JFK. A big day awaits. They’re the latest class to take part in what has become a rite of passage for many, a day when business students trade a UVM classroom for a Manhattan boardroom as their learning ground. It’s a critical element of BSAD 228, Wall Street Seminar, a course that gives undergrads in the Grossman School of Business experience in professional equity analysis and mergers and acquisitions. Launched in 2003 by professor emeritus James Gatti, it is now taught by associate professor Andrew Prevost. The short flight is a chance to grab sleep or gather thoughts. Queens to Manhattan, the mood is light on the subway. Students crack jokes, listen to a fellow passenger dropping rhymes to help pay his rent, peer at their laptops with one last run-through of presentation slides. The vibe turns decidedly more serious after they arrive at a Starbucks on 47th and Broadway, where they nervously sip coffee before walking next door to Morgan Stanley, filing through security, then taking an elevator to a boardroom high above the city. Awaiting them are UVM alumni Steve Penwell ’84, Morgan Stanley’s director of equity research for North America, and Jamie Flicker ’89, managing director and partner at Greenhill & Co., LLC. After brisk greetings, it’s right to the business at hand. The twelve students in the 2017 Wall Street Seminar, divided into three groups, have spent the weeks leading up to this day at work on a financial projection model to determine the valuation of Goodyear Tire, Abbott Laboratories, and Corning, Inc., then advise investors whether to buy, sell, or hold stock. Now, it’s time to step up. The students say they are convinced there is pent up demand for certain types of tires. “That seems like a pretty key assumption without any data to support it,” Penwell responds. “Admittedly, we are putting pretty far across the green, per se” Matt Duff says. Across the fourteen years of the Wall Street Seminar’s existence, this investment world dry run, coupled with some tough love applied as needed, has been the linchpin of many students’ business education. Gatti says the benefits of the first trip to New York for students far exceeded his initial expectations. To this day, graduates of the seminar let him know how significant the experience was to their careers. Keller’s father, James R. Keller ‘72, president of Green Mountain Business Consultants and chair of the UVM Foundation, has funded travel and other expenses associated with the seminar, inspired, to a large degree, by the experience of his son. 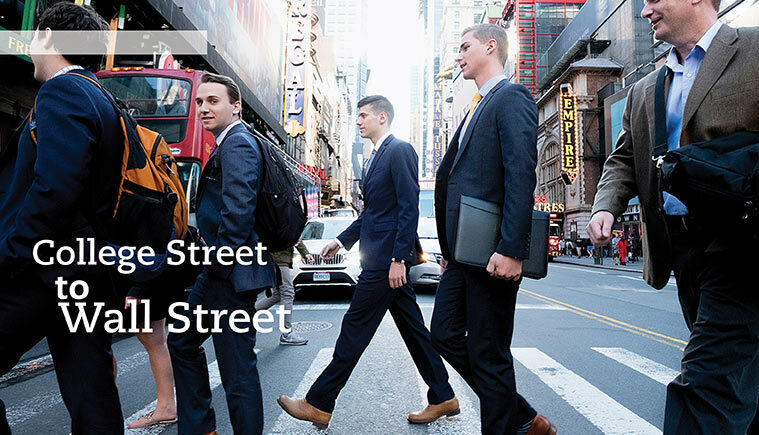 A similar spirit drives the alumni who make the class possible through hosting the Wall Street visit and giving guest talks up in Burlington throughout the semester. More recently, the course has expanded to include help from younger analysts and associates at Morgan Stanley. Patrick Halfmann ’14 gave a presentation at UVM on how to give a professional stock pitch. Evan Silberberg ’16 G’17 helped students build a fully functioning financial model before they started working with analysts. “I’m just returning the favor,” says Silberberg.